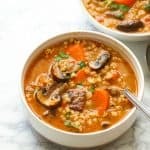 Beef Barley Soup – beefy soup loaded with tender chunky beef, plump pearl barley and vegetables. So belly-warming, filling and scrumptious for a soup. A complete meal in a bowl! Soups are a staple here at home whether it’s winter or summer. And believe me, I could eat it everyday, with or without the bread on the side. I don’t know about you, but soups are so nourishing to your body. It gives you that peaceful mind in each every spoonful. Even at my age, I still find it super comforting and it suddenly lifts all the heavy loads in me. And this Beef Barley Soup here is no different. Can you cook barley in soup? How long to cook barley? Barley is an underrated grain. With its chewy and nutty flavor, it sure is a great addition to any hearty soups. It actually comes in two kinds: hulled and pearl. Hulled barley has the tough, inedible outermost hull removed, but still it retains its bran and endosperm layer. A light golden brown in color, it’s the chewier and nuttier version between the two. 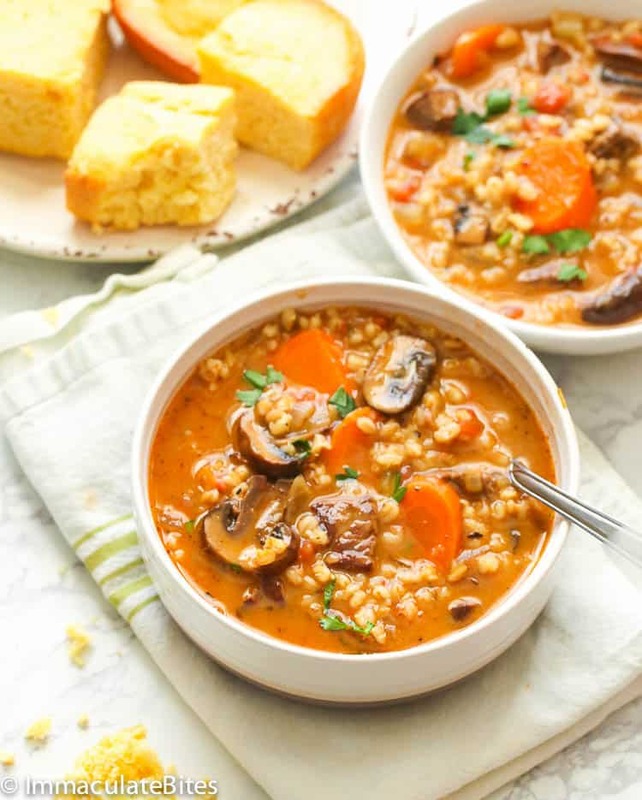 For this Beef Barley Soup recipe, I use the pearl barley version. It’s pale, creamy-colored grain that is less chewy and cooks faster than the other one. So to answer your question, yes it does cook in a soup. It even helps thicken the soup as it releases starches into its cooking liquid. It cooks around 25-30 minutes which is just exactly as when the beef tenderized in this recipe. Yes, you can, however you must remember though that quinoa cooks faster than barley and it’s flavorless; it pretty much takes the flavor on whatever its liquid. You may use quinoa in almost any recipe that calls for barley, farro, bulgur or any other grain. And the best part of all is that it packs a nutritional punch like protein, carbohydrates, calcium and iron. Quinoa also pairs well with cooked or raw vegetables. 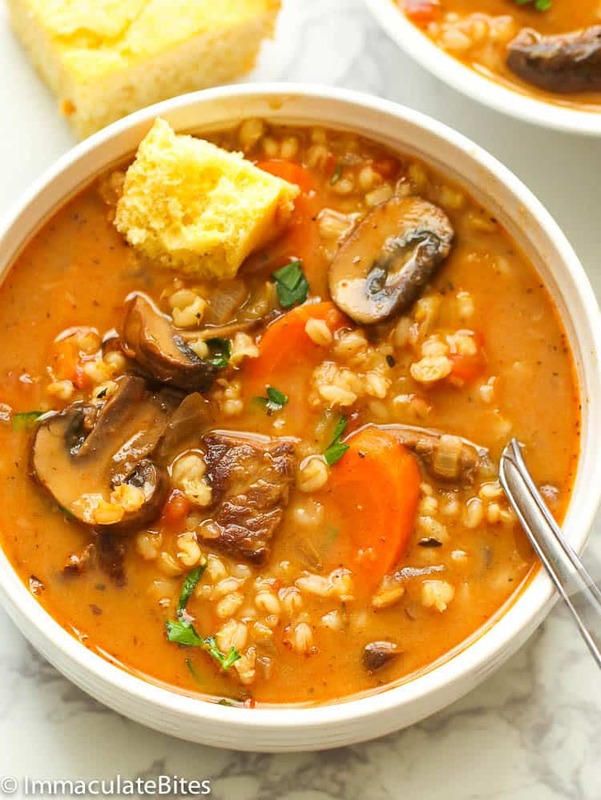 What is the best beef for beef barley soup? 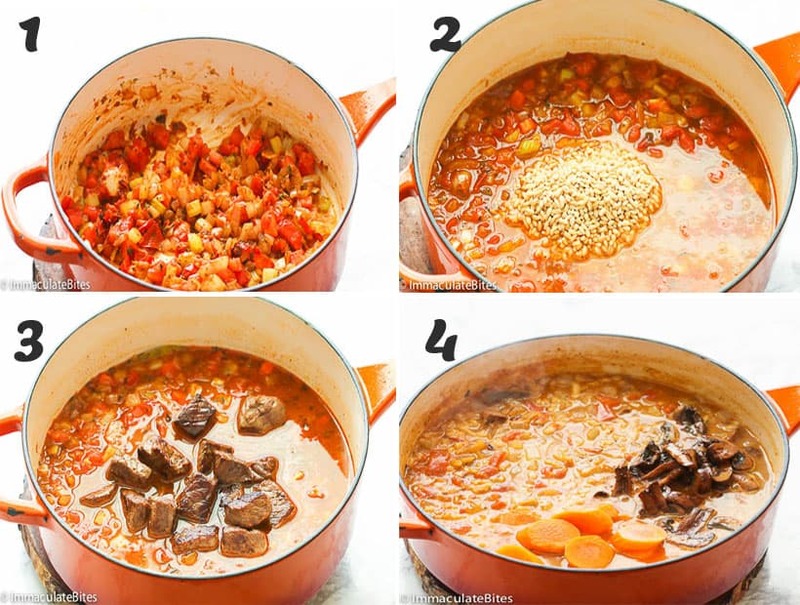 The best beef cut for beef barley soup is beef stew meat which usually comes pre-cut into cubes and packed in most grocery stores. Or if you have leftover pot roast, roast beef or leftover steak, that would do fine as well. And yes, you certainly can use ground beef in this recipe if you don’t want all those chunky meat. Just make sure to brown the ground beef first and drain any fat before adding anything into the pot. 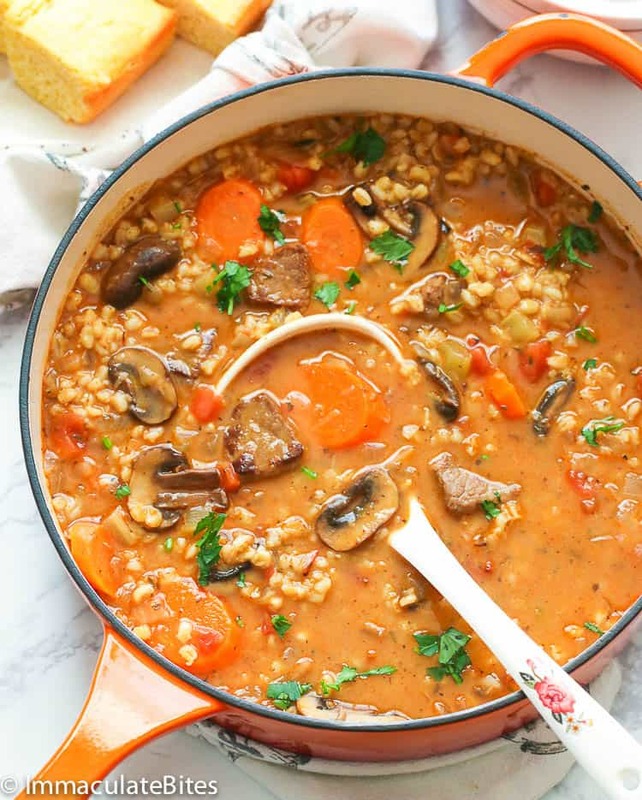 This Beef Barley is not just packed with meat, veggies and nutrients but also with flavors. I suggest you don’t skip the Creole seasoning as it add depth in flavor and a little bit of kick into it. It’s hearty, fragrant and aromatic. A perfect cure to all those winter blues. Make a big batch of this freeze, so you can enjoy it whenever you want. A complete meal in a bowl. Serve it with this cornbread here or your favorite bread rolls. Want more soup recipes to add to your menu? Try any of the these: Vegetable Beef Soup,Homemade Chicken Noodle Soup, Minestrone Soup and Chicken Meatball Soup. If you can’t find barley, you may substitute it with quinoa (which cooks faster by the way just about 15 minutes with a ratio of 2 cups of water to 1 cup of quinoa). Or simply replace it with rice instead. 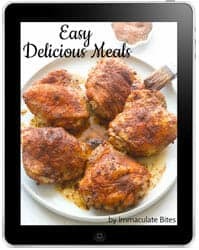 You can make this using your slow cooker. Cook it on high for 4 hours or 7-8 hours on low. This soup can be made with ground beef, leftover pot roast or roast beef. You may add potatoes if you want to. Feel free to switch up the veggies. To freeze this soup, let it cool down first (or any leftover) and store it in an airtight container and freeze for up to 3 months. Simply thaw it overnight in your fridge the night before serving and reheat in a saucepan over the stovetop. Do not skip the browning of the meat as those brown bits in the bottom of your pan will add rich flavor to this soup. Beef Barley Soup - beefy soup loaded with tender chunky beef, plump pearl barley and vegetables. So belly-warming, filling and scrumptious for a soup. A complete meal in a bowl! Heat olive oil in a large pot over medium heat. Add the beef, sauté stirring frequently any browned bits off the bottom of the pot until beef is brown. Set aside. On the same pot, add mushrooms and saute for about 3-5 minutes . Be careful not to let it burn. Set aside. Add onions, garlic, ginger, bay leaves , thyme, oregano and saute for about 3-4 minutes until onions are wilted. Then add paprika, Creole seasoning , celery and tomatoes. Pour in beef stock or water, barley, browned beef, carrots, mushrooms, beef bouillon, Worcestershire sauce and salt and pepper. Bring to a boil, cover and simmer until beef is tender, about 25 – 35 minutes. You might have to add more water or broth, if needed. Adjust seasonings to taste . On the same pot, add mushrooms and saute for about 3-5 minutes . Be careful not to let it burn. Set aside. Add onions, garlic, ginger, bay leaves , thyme, oregano. Saute for about 3-4 minutes until onions are wilted. Then add paprika, Creole seasoning , celery and tomatoes.